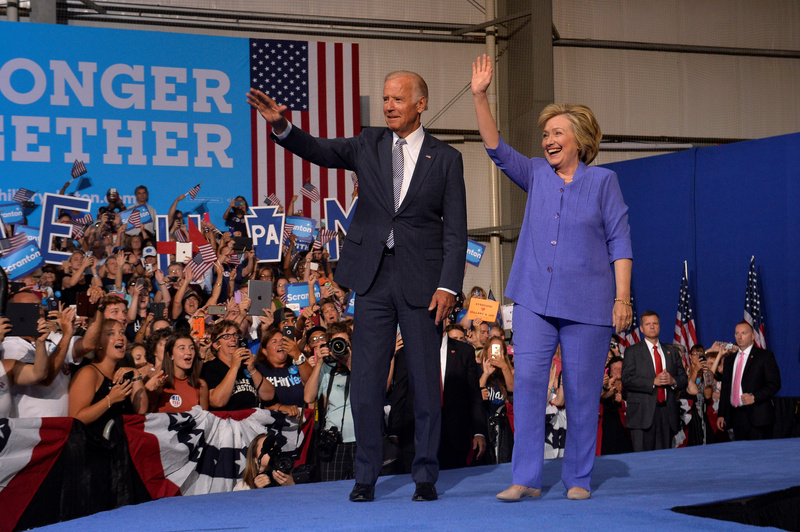 SCRANTON, Pennsylvania -- Campaigning alongside Hillary Clinton for the first time on Monday, Vice President Joe Biden offered a personal testament to the Democratic nominee's character while warning voters in a crucial swing state against a Donald Trump presidency. "If you live in a neighborhood like I grew up in," Biden said, speaking at a campaign rally in Scranton, Pennsylvania, his hometown, "if you worry about your job, getting decent pay, if you worry about your children's education, if you're taking care of an elderly parent after losing the other one, then there's only one person in this election who will possibly help you, and that is Hillary Clinton." The rally, which was held at an indoor sports facility and drew a crowd of 3,000, was rescheduled last month after the fatal shooting of a group of police officers in Dallas forced the Clinton campaign to suspend its campaign schedule. It was a homecoming for Biden, and also for Clinton, whose father, Hugh Rodham, was born in Scranton. Clinton spent her summers as a girl traveling back to Northeast Pennsylvania with her family. With letter signs that spelled out "Welcome Home" waving behind her, Clinton said there "was only one answer" when she and Biden were deciding where to make their first joint appearance. "While the Bidens were on North Washington Avenue, my family, the Rodhams, were a few blocks away on Diamond Avenue," Clinton explained. "I was christened at the Methodist church on Court Street." Clinton also made a campaign stop in Scranton back in April, ahead of the Pennsylvania primary. She worked the dinner tables at an Italian restaurant, Casa Bella, before holding a rally at nearby Dunmore High School. "I met people who said things to me like, I knew your cousins, I knew your uncles," she said. "I had one man say 'didn't we sled down Court Street one winter? '...It just brings back a flood of the best memories and the best people." Then and on Monday, her brothers, Hugh and Tony, joined her at her events. Biden said that the people of Scranton -- whom he described as having "grit, "courage" and "determination" -- deserve a president "who's made of the same stuff." At times quieting the audience and asking them not to clap or cheer, the vice president argued that Trump's promises to middle class families are "a bunch of malarkey." "She has always been there, that's her life story," Biden said. "Let's state the obvious. That is not Donald Trump's life story." Biden went on to further question Trump's preparedness to tackle the issue of America's national security, and his willingness to learn. He invoked the memory of his son, Beau, who died last May. "My son, Beau, served for a year in Iraq, came back a highly decorated soldier," Biden said. "I must tell you...had Donald Trump been President, I would have thrown my body in front of him. No, I really mean it, to keep him from going, if the judgment was based on Trump's decision." In particular, Biden assailed Trump's recent comment that President Barack Obama "founded" the Islamic State, or ISIS, as both an "outrageous" and "dangerous" statement. Trump also called Clinton the "co-founder" of ISIS. "If my son were still in Iraq, and I say to all those who are there, the threat to their life has gone up a couple clicks," Biden said. "It's gone up a couple clicks." Biden also mocked Trump for positive comments he's made about some of the world's autocrats. Biden's response to Trump came shortly before Trump was scheduled to begin a policy speech on terrorism in Youngstown, Ohio. Clinton, in her remarks before Biden's speech, said Trump has "been all over the place on ISIS." "He talked about letting Syria become a free zone for ISIS," she said. "He's talked about sending ground troops -- American ground troops -- well, that is off the table, as far as I'm concerned." She hit Trump for "sometimes" holding back the details of his proposals "because he wants to keep his plan, quote, 'secret.'" "The secret is, he has no plan," she said. Clinton will continue to campaign in Pennsylvania on Tuesday; she'll appear at a Pennsylvania Democratic Party voter registration event in West Philadelphia for supporters and volunteers. A recent poll by NBC News, the Wall Street Journal and the Marist College Institute for Public Opinion, found that registered voters in Pennsylvania favor Clinton 48 percent to 37 percent. Clinton was up 9 points before the Republican and Democratic conventions last month. "I know some of you may have friends...who are thinking about voting for Trump," Clinton said, to scattered boos from the crowd. "Friends should not let friends vote for Trump."